Not to oversell myself – but, if you like stories about ‘man versus nature’ or ‘man versus machine’ – then this is your blog. And, if you winced when you read the word ‘man’ instead of the word ‘human’ know that this blog is written by a woman, and a former technical writer who is compelled by a naughty streak and the rush of writing without an editor. 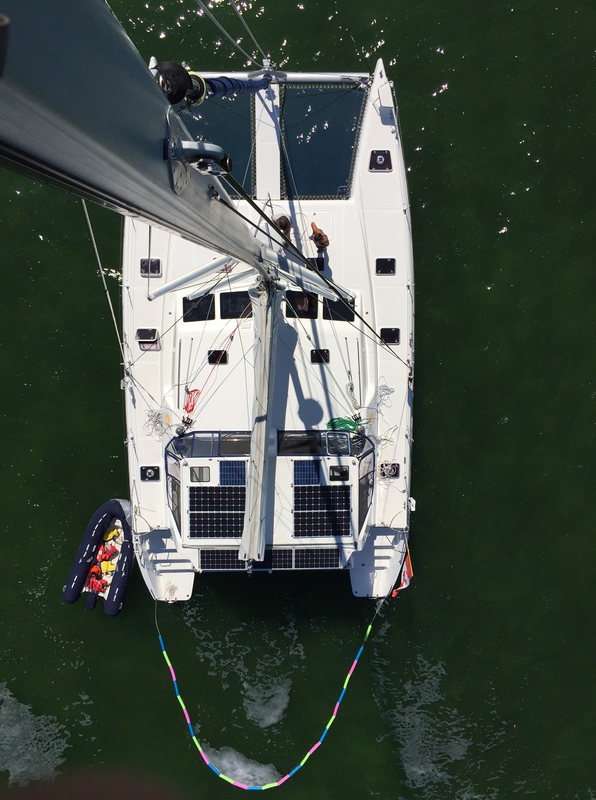 So here we are in our first few weeks of cruising on our St Francis 50 catamaran. The learning curve has been steep. Don’t get me wrong, we’re not out floating in small circles, while toilets overflow and trash bags accumulate. It’s just that, we are gaining practical sailing skills, learning how the seedy underbelly of our boat works, and homeschooling our four children. The combination keeps us very busy. Last week, and fittingly, as an example of ‘man versus nature’, my husband untangled our rigging, as waves pummeled our front windows. That’s a story in itself. Today, he went up our 60+ foot mast. To build upon the ‘man versus machine’ theme we have been facing off with our solar panels, generator, water maker and fridge/freezers. It’s intimidating. My husband is very technical and handy. He claims to have received his first real drill as a gift at age three. But I resort to the user guides, which are often quite unapproachable. The documentation tends to be examples of what happens when companies let techies communicate their brainchild without any ability to relate to their fellow man, or human. Thank goodness we have the support and experience from people like our friend, Dave (O’Vive) and our advisor, Pat Reischmann. They’ve been with us since the early days of this project – from the pre-purchase decisions to the most recent refits. We can’t thank you enough. I always enjoy checking in on your blog. I hope you’re feeling better and the pictures are wonderful. How is your Leisure Furl mainsail experience going. Did tensioning the boon vang help?